Earlier this spring, we received an unsolicited email from a guy who sells mail-order meat. But, we also didn’t know whether and why these steaks — finely pedigreed as they may be — would be tastier than other well-regarded brands that a man could order from home. This called for more steaks. So we got more steaks. Eight brands of ribeye, to be exact, representing the best this country has to offer — some wet, some dry, some grass-fed, some fed with grain. To eat them, we invited readers to The Great Steak Debate at David Burke Kitchen, sponsored by Citi (photos from the event are right here). Every eater voted for their favorite bistec. So, too, did the professional judges in attendance: WABC-TV reporter Lauren Glassberg, Tasting Table founder Geoff Bartakovics, “Meat Bureau Chief” for Serious Eats Nick Solares, Food52 Senior Editor Kristen Miglore, CEO of Max Brenner Sam Borgese, GQ Contributing Editor Alan Richman and creative consultant Robert Skollar, who was chosen from among our readers. Below, the steaks we ate, and which the eaters liked best. You can get each of these steaks at home. And trust us, they’re all excellent. Atlanta, GA. Grain-fed, wet- and dry-aged 45 days. Born in ’66, Halperns’ was one of the first companies in the U.S. to distribute boxed beef. Also happens to be the house beef for Atlanta’s finest restaurants (Aria, Rathbun’s) and New York’s David Burke Kitchen. 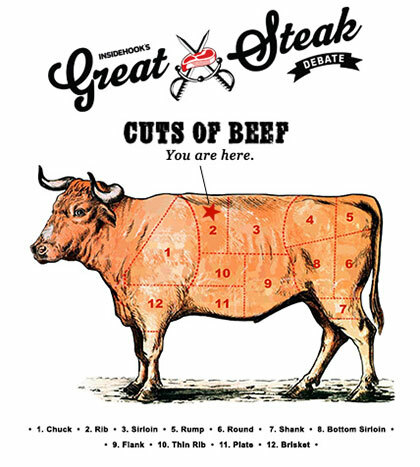 Halperns’ was the favorite at The Great Steak Debate by a wide margin. Fork-cut tender. Order online. Omaha, NE. Grain-fed, wet-aged 21 days. Omaha. The very word sends chills through the incisors of most critics, who often disparage this popular purveyor as a distributor of fatty, sub-choice stock. But the taste. Oh, the taste. Our judges had a hard time putting their forks down. Omaha for the win. Order online. Carbondale, CO. Grass-fed, dry-aged 15-21 days. You can’t get more natural than Crystal River. Hereford and Angus fed on open fields, nourished on mother’s milk and never finished with grain. If you’re cooking for conscientious and discerning eaters, this is what you order. Order online. Dillon, MT. Grass-fed, wet-aged, 18-21 days. They’ve got their own ranch. They’ve got their own cowboys. They ship their meat direct to you. It’s all organic, dense, flavorful, juicy — and the earthy taste is strikingly different from most other brands. Order online. North Bergen, NJ. Grass-fed and grain-finished, dry-aged 30 days. A NY tri-state family concern since 1909, LaFrieda sources its meat from family farms across the U.S. and supplies steak and hamburger beef to storied New York restaurants like The Spotted Pig, Minetta Tavern and Shake Shack. Order online. Larkspur, CA. Grass-fed, dry-aged 21 days. The new left coast darling among the beef-gnoshing set, Belcampo is your kinder/friendler purveyor: all grass-fed, all free roaming, all-natural beef. Bonus: These vertically integrated ranchers own their own farm. And their own butcher shop. And their own restaurant. Their online store is coming in November. Springfield, IL. Grass-fed, grain-finished, wet-aged 30 days. Prime beef, and tasty. That’s what you’ll get with Bunn, the first purveyor to send steaks to InsideHook’s office and the inspiration behind The Great Steak Debate. Order online. Farmingdale, NY. Grass- and grain-fed, custom aging. A popular purveyor and butcher shop on Long Island, Main Street specializes in USDA Prima and Choice cuts, sourced primarily from the Midwest and dry-aged in-house to produce a dense and flavorful steak. Ordering info online. All photos courtesy of Eric Medsker.